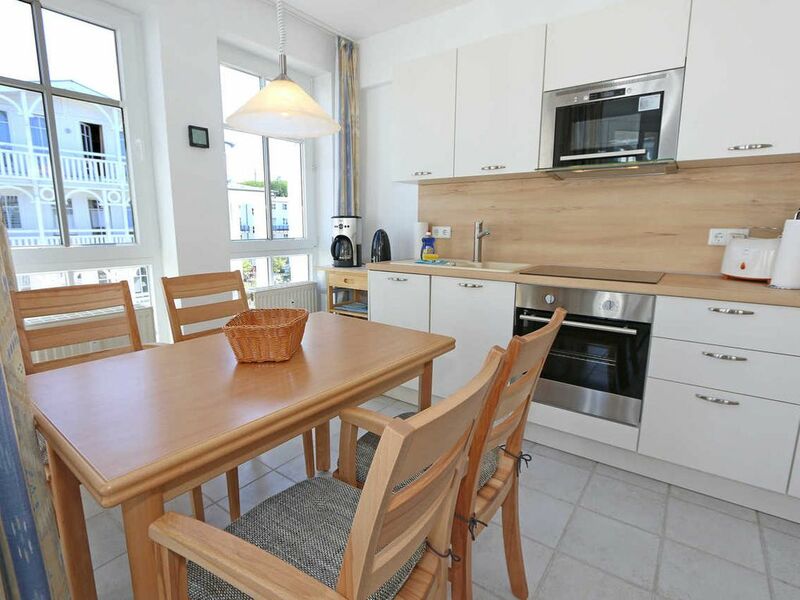 The bright and cozy Non smoking apartment is located in the second Floor of the house Moritzdorf in Seepark Sellin. The approximately 48 square meters large living space offers enough space for 2- 4 people. The dining area has a modern kitchenette with induction hob, sink, refrigerator, dishwasher, microwave, oven, coffee maker, toaster, kettle and various kitchen utensils. A bright dining table with 4 chairs invites you to a meal. In fully tiled living area you can unwind in a relaxing chair - make yourself comfortable - perhaps after a long beach walk. A couch (extra bed for 3rd and 4th Person / 1.40m x 1.90m) completes the offer. Flat screen TV, mini stereo system with DVD player including technical home furnishings as well as free use of a Wi-Fi connection for you. From the living area you reach the large cabin layout balcony (west). A cigarette or a cigar can certainly enjoy here. In the apartment we ask in consideration of other guests about not smoking. Between living room and bedroom is the bathroom. It is equipped with a bathtub (from spring 2018 with a walk-in shower) a toilet and a sink. A hair dryer is available. The lined with vinyl bedroom offers a double bed (2 x 0,90m x 2,00m), bedside cabinets and a spacious wardrobe. For our younger guests is 1x travel cot (without extra mattress, without Bettinlett) and 1x high chair included. A private parking space (No. 86) is available in the underground garage (height 1.80 m) for your exclusive use free of charge. Bicycles can be stored safely in the basement. Pets are not allowed. The initial equipment of a linen package (complete bed linen, 1 towel, 2 small towels) you can book up to 14 days before arrival for 15.00 € per person or supplement by own. For packages booked for 2 or more you will receive 1 dish towel and 1 shower mat once. We wish you a relaxing holiday on the beautiful island of Rügen in Sellin! The Selliner Seepark built in the style of modern seaside architecture. In House Moritz village there is the apartment with balcony 447 in. 2 Floor. In just a few steps from different stores (such. B. Bakers, food retail, post office, hairdresser, laundromat, etc. ), restaurants as well as the water park, AHOY Rügen '. Here you have 580 square feet of space, inviting you to relax. Below you will find an outdoor swimming pool, slides, jacuzzi, various saunas and solariums. The famous pier of Sellin away by foot, 500 m away. Here you can also make in the summer of the same on a fine sandy beach easily. In the immediate vicinity of your apartment is the stop of the narrow-gauge railway of the "Racing Roland", which takes you to Putbus. Sehr sauber, modern eingerichtet, alles neuwertig. Schöne Ferienwohnung, die keine Wünsche offen lässt. Die Wohnung ist schön eingerichtet, in der Küche ist alles vorhanden was man braucht und von gehobener Qualität. Wir haben uns sehr wohl gefühlt und es war der perfekte Ausgangspunkt um die Gegend zu erkunden. 10 Minuten zur Seebrücke, Bäcker und Edeka keine 200m entfernt und den Bahnhof vom Rasenden Roland quasi um die Ecke. Zu zweit alles toll aber mit 3 Personen ist es schon etwas klein obwohl es für 4 Personen wäre. Ansonsten Ausstattung außer Schlafmöglichkeiten alles prima.